Marching percussion: Where are we now? 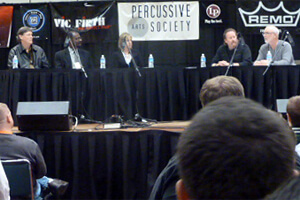 Marching percussion panelists at the November, 2011 PASIC. At the recent Percussive Arts Society International Convention (PASIC) in Indianapolis, the final day of events included a marching percussion panel discussion moderated by Dennis DeLucia, DCI Hall of Fame broadcast analyst and former Bridgemen instructor and arranger, titled, "Where Are We Now?" Panelists included Tom Float, formerly with Oakland Crusaders, Spirit of Atlanta and Blue Devils and now with Disney, Pedro Orey, percussion instructor for the famous Berthune-Cookman College show band in the HBCU (Historic Black Colleges and Universities) tradition, Julie Davila, a WGI indoor marching percussion judge and nine-year chair of the PAS marching committee, as well as an instructor of high school indoor marching percussion lines, Scott Johnson, formerly of Santa Clara Vanguard and now Blue Devils, Thom Hannum, formerly of the Cadets and Star of Indiana and now with Blast! and Associate Director of Bands at the University of Massachusetts, and Ralph Hardimon, formerly of Santa Clara Vanguard and Blue Knights. Over the course of the hour-long discussion, DeLucia asked those on the panel how they got into working with marching percussion and how they began arranging for the activity, focusing on the evolution of marching percussion innovations. It turns out all of the panelists who have decades worth of experience in the percussion field, first listened to drum corps recordings and then played along, analyzing the drum parts by slowing down LPs from 33 rpm to 16 ½ rpm. Many of the instructors were strongly influenced by DCI Hall of Fame member Fred Sanford, who created the symphonic style of the Santa Clara Vanguard line 40 years ago. Of interest to many was that half of the panel is left-handed. Attendees who packed the room learned that today's percussion teachers throughout the growing high school percussion activity are largely trained in drum corps, something Johnson spoke about when stating, "We in DCI have set the standards that high schools and colleges have emulated. We are the evolution of marching percussion." Hannum agreed, adding, "DCI has evolved the ensemble, elevating the show design that resulted in better individual skills." Float's take on this was, "Drum corps is the medium that allowed for the development of instrumental and arranging techniques. We dealt with time delays, balance, acoustics and technical elements that allowed the outdoor percussion to take root and soar." According to DeLucia, "This panel discussion should be the basis of creating a documentary on the movers and shakers of marching percussion. I have to admit I was nervous up here … This transcended any one of us." 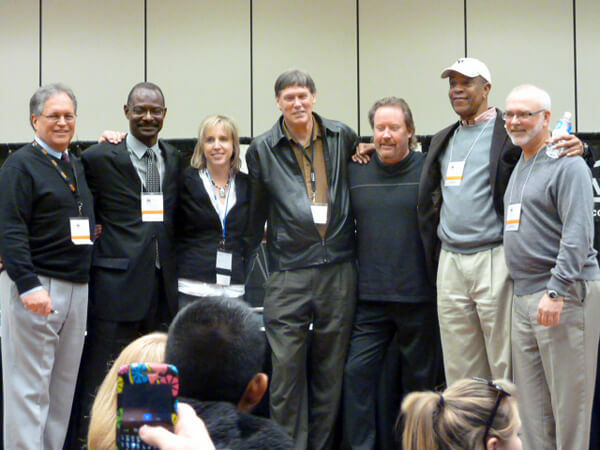 From the left: Dennis DeLucia, Pedro Orey, Julie Davila, Tom Float, Scott Johnson, Ralph Hardimon, Thom Hannum.